Tracking down costumes can be tough. 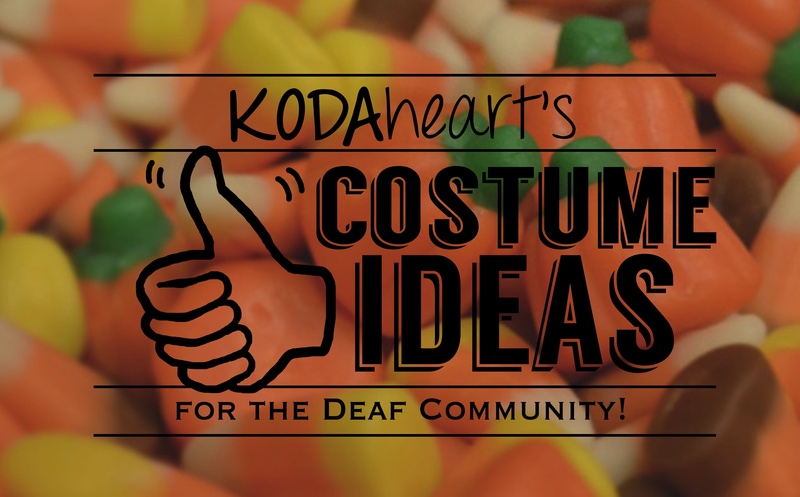 This year the KODAheart team has ‘drawn-up’ a list of 10 costume ideas designed to showcase your cultural pride! Some of them are silly and many of them require some creativity and artistic skill, but all of them will be a hit at your costume party! 1. What about showcasing some technology? Dress as a TTY tell everyone HAPPY HALLOWEEN GA ! There are many to choose from, you can dress as the Big Green Monster, the recognizable printing 1990s version, or a modern silver pay-phone model! Need another idea? Check out our list of #throwbacks of the US Deaf Culture. 2. What about making a costume out of your favorite ASL idiom? Our idea: TRAIN-GO, SORRY. Dress as a train conductor and end every conversation abruptly and refuse to repeat yourself! 3. Celebrate the accomplishments of successful Codas! For example, in honor of Azie Taylor Morton, dress up as American currency. 4. Go as a historical figure from Deaf History! A little creativity and some period-clothing and you can be Laurent Clerc or Alice Taylor Terry! Get the whole family together and dress as the Gallaudets. Or choose your hero from the Koda Spotlight page! 5. Dress as a memorable Deaf Community landmark! For instance, a little cardboard and paint and you can be Gallaudet University’s Coffin Door. Don’t forget to warn people that they won’t graduate if they pass by you! 6. How about dressing as an entry in an ASL dictionary? This could be a lot of fun with the whole family too! Choose your word or phrase, grab some cardboard, cut holes for your arms and face, and start painting! 7. Get ready for the catwalk! Dress as Nyle from America’s Next Top Model and strut your stuff Tyra-style, fierce. 8. Add some closed captioning to your evening! Use cardboard and paint to create signs or panels with frequently used phrases and auditory cues. 9. Do you have a favorite character from the TV show, Switched at Birth? Grab a wig and some clothes to create your look! 10. Make use of your camp t-shirts and dress as your favorite camper/counselor! What awesome costume ideas did you come up with for Halloween this year? Send us your pictures! If you use one of these ideas, let us know how it turned out!